I'll post this here, This is the famous Jagdpanther built by Stuart Humphreys some 10+ years ago, I know it needs very little but if I'm going to make it my own without offending is legend if you know what I mean and change it compleatly. 3. Fit a decant smoker unit. 4. Fit working convoy lights. 5. Buy another figure that will be sat on the rear hitching ride , this will be static not like the other 2. I think that's it for now , This may well be the last pic of it like this you will ever see I just hope I can do this amazing Jagdpanther some justice for a man that was an amazing modeller to say the least, I'm planning on some way of keeping the origanal identity of who built it by having the name HUMPYS LEGEND on the tank somewhere which may take a lot of thought I just hope I don't upset anyone doing this tank and builder an injustice. It's yours and needs to be how you like it. Do it. As to a decent smoker, have a look at the super smoker 4 , available from Australia ( mine took less than a week) on ebay most of the time. I've got two in the Chally and they really pump it out. The tank is now almost stripped right down, I've repaired the light damage to the upper hull, and have given that 4 Coates of red oxide, and 2 Coates of Dark Yellow and is now put in the spare room away from the workshop so I can work on the lower hull. On sripping down the lower hull I've found it needs 5 new tyres and 3 wheel bearings and 1 new motor as its almost seized but I'm going to replace both, So it should soon be as good as it was the day Stewart finished it. I think some of the dolly’s came with them once upon a time possible Modellers Loft, the Hakenkreuz is hard to come by even on evil bay owing to its past not to mention its illegal in a number of countries try Field of Armour but be warned he only uses the most expensive form of postage and declares everything for import duty which means whatever you see will be more than twice the price by the time you get it. 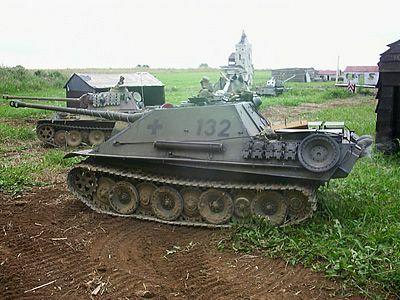 It’s your tank but the Germans stopped displaying the Hakenkreuz flag on vehicles after the battle of Kursk, a Jagdpanther G2 from late 44 early 45 wouldn’t have this.